This paper is concerned with a system of equations that describes the motion of two point vortices in a flow possessing constant uniform vorticity and perturbed by an acoustic wave. The system is shown to have both regular and chaotic regimes of motion. In addition, simple and chaotic attractors are found in the system. Attention is given to bifurcations of fixed points of a Poincaré map which lead to the appearance of these regimes. It is shown that, in the case where the total vortex strength changes, the “reversible pitch-fork” bifurcation is a typical scenario of emergence of asymptotically stable fixed and periodic points. As a result of this bifurcation, a saddle point, a stable and an unstable point of the same period emerge from an elliptic point of some period. 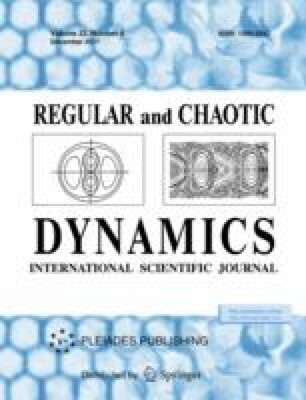 By constructing and analyzing charts of dynamical regimes and bifurcation diagrams we show that a cascade of period-doubling bifurcations is a typical scenario of transition to chaos in the system under consideration.